The Choice on DVD & Blu-ray Now! It seems to me that it is rare for a great romantic movie to come out. But finally, we have The Choice from the ultimate romantic novelist, Nicholas Sparks! It was a classic love story with a storybook ending! If you love a good chick flick, happily ever after or a romantic movie, YOU GOTTA SEE THE CHOICE! 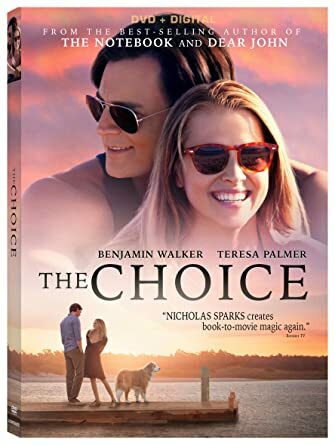 From novelist Nicholas Sparks, the author of classic love stories The Notebook and Dear John, the year’s most moving romance, The Choice, will be available on Digital HD April 19 and on Blu-ray™ (plusDigital HD) and DVD (plus Digital) on May 3 from Lionsgate. Based on Sparks’ best-selling novel, written for the screen by Bryan Sipe (Demolition), and directed by RossKatz (Adult Beginners), The Choice stars Benjamin Walker (Abraham Lincoln: Vam pire Hunter), Teresa Palmer (Warm Bodies), Maggie Grace (Taken series), Alexandra Daddario (San Andreas), Tom Welling (TV’s “Smallville”) and Academy Award® nominee Tom Wilkinson (Best Actor, In the Bedroom, 2001), in a touching love story that will make viewers laugh, cry, and wonder how far they would go to keep the hope of love alive.